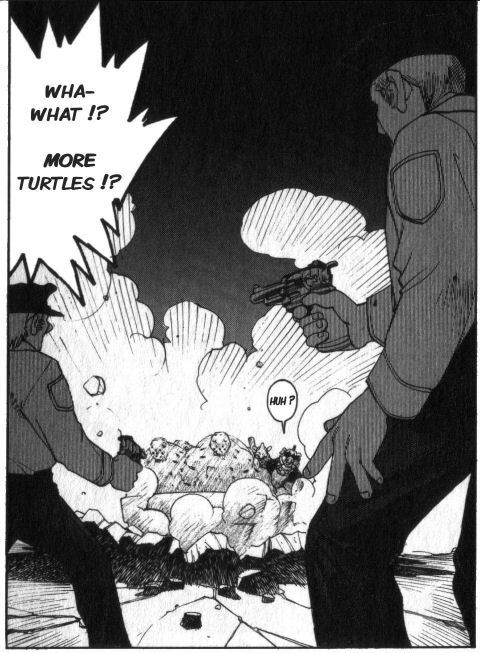 And here’s Mutant Turtles Gaiden Chapter 2. Expect chapter 3 within the next couple days. This entry was posted in Mutant Turtles Gaiden, Teenage Mutant Ninja Turtles and tagged japanese, joint_project, TMNT, TMNT_Gaiden. Bookmark the permalink. Great work on this, especially on the preservation of the translator’s note! I’m sorry some of the scans are so dark and disfigured in the spines, but my scanning skills do get better in future issues! That’s good to hear, the blurry/dark spines were somewhat upsetting as there isn’t too much to be done about them. If you are willing to do the whole thing over again, I can probably this issue for you. I’d rather not, but if you think it will add to the presentation significantly, I’ll do it. I don’t think it’s really necessary, but maybe someday when everything else is done we can do an OMG SPECIAL EDITION with new scans, hah. Oh, yeah, good idea! Maybe we could even get a colorist! My scan quality along the spines improves with Super Turtles #1 and #2, although they may require some cropping and rotating to get them straight. If you think any page needs to be redone entirely just let me know. DrSpengler has my email. I was thinking about attempting colorizing some pages actually, now that you mention it. Maybe you could rescan the chapter title pages for 2 and 3? The fold blur really gets to those the worst, I think. The scans should be on their way. What makes the chapter title pages especially difficult is that the art runs right into the page binding, making perfect scans almost impossible. Other pages usually cut off at a panel and leave blank space. Still, the replacement scans should look better than what is currently available. Also, regarding Chapter 4, I accidentally scanned most of it in color as opposed to grey-tones, so you’ll need to correct it to give the book consistency. Again, if you want the whole section rescanned, I’ll be willing to do it, seeing how much great work you have already put into this project! any chance of this getting something other than .cbr? You can rename the file to .rar and it will extract to JPGs. Is there another format you’d want it in? I could do others probably.